The PoweredUSB hub allows the OEM to add PoweredUSB technology to their existing products. Power to the ports is controlled by an exclusive CyberData peripheral power saving function that let's the PC control the power to the Hub by means of the Windows Sleep or standby function. The CyberData PoweredUSB 6-Port Hub provides a simple and affordable way to add up to six PoweredUSB ports to a standard PC. 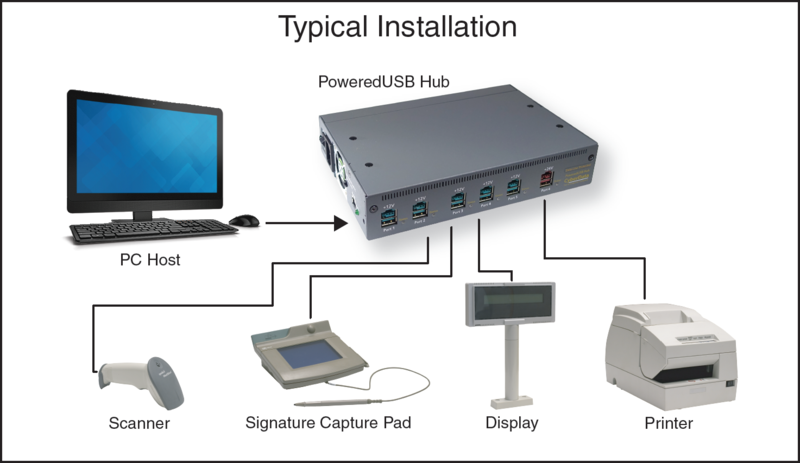 The hub offers one +24 volt port with ample current available for a multi-station POS printer and five +12 volt ports. The CyberData PoweredUSB hub is designed with circuitry that protects the communcation and power lines from damage when hot plugging non-PoweredUSB compliant peripherals. *All ports support standard "A" type +5V USB connection.